1) If you have just a dirt and oil scum build up,a combination of soap and a small amount of pool acid can be scrubbed on tile to clean it. 2) If the tiles have a small amount of calcium build up,a product called Scalemaster works good....you just spray it on and leave for a few minutes,then scrub tiles with a scouring pad. 3)If the tiles have a severe amount of calcium build up,you can use a pumice stone,BUT...the pumice may leave scratches on the tile glaze which may be very noticeable,especially on lighter colored tiles. On the other hand,if your tiles are already pretty beat up,you may not care. 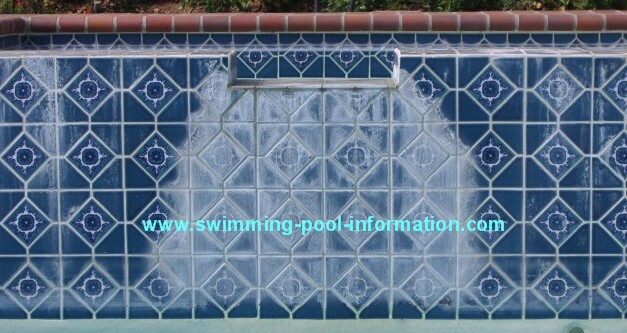 4)The photos on this page show a method where the water is lowered below tile level,then the tiles are blasted with plastic beads to remove calcium and dirt deposits. When the job is finished,the plastic beads are simply vacuumed up and the pool refilled. The photo Below shows half of the tiles are blasted, and then a seal is applied to tile which helps keep the calcium from adhering to tile making future clean up much easier. This process can be applied to rocks around the pool or flagstone too! 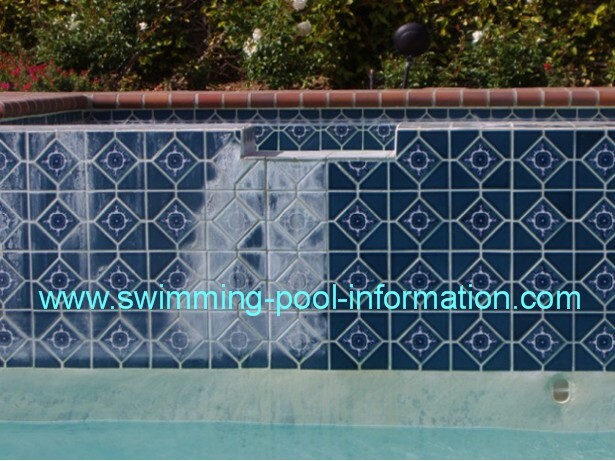 This company repairs tiles and also resurfaces concrete water slides. 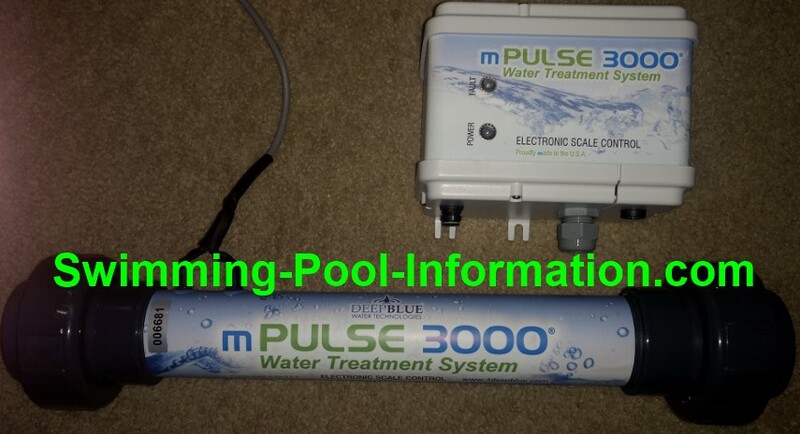 The photo above shows the mpulse 3000 - the cylinder goes on return line to pool and the unit uses low voltage high frequency impulses to change calcium bicarbonate to calcium carbonate to prevent scale.....I am a dealer can have unit shipped to your house. Shown below is before and after photos of a job that had calcium on the tiles as well as the flagstone. The particular company that did the work pictured on this page works in the following area codes: 661 818 805 and the following areas: Camarillo San Fernando Valley Pasadena Thousand Oaks Simi Valley Glendale Santa Clarita Newhall Saugus Canyon Country and others in those areas. If you are in the greater Los Angeles area in area codes 213 310 323 I know another company that works those areas using the same techniques.